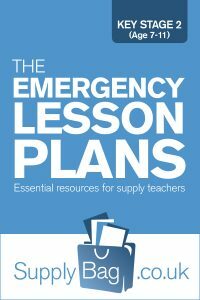 These emergency lesson plans for Year 4 Geography are only to be used by supply teachers who are faced with no planning or easily accessible resources. Also to be used following the guidance notes here. Improving the environment Survey how much paper etc. they think their class throws/wastes in a day, multiply by five for a week, then by 'n' for the whole school to emphasis. Get children to design poster to go up in other classrooms to encourage recycling, using both sides of paper etc. Village settlers Draw a sizeable island on the board, river running through, beaches, cave, forestation etc., and ask children to label/describe where they would live if they were stranded on the island. Emphasise close to water, building materials (or cave for shelter.) Why would they settle there? Why do they think early settlers chose to live in their village/town? A village in India This is usually Chembakolli. Ask children to draw a table of differences between their locality and Chembakolli – employment, lives of children, buildings, homes, leisure and food. What do they know, what would they like to know, how would they find out as extension. How and where do we spend our time? Do a class survey on what leisure activities they did at the weekend. Children to present the results they found. Look at level of exercise on average, and ask children to come up with ways to help children increase the level of exercise, and use of local facilities i.e. park, walks, swimming pool. How can we improve the area we can see from our window? Draw/label what the view from your window (in school?) will be like in the future.